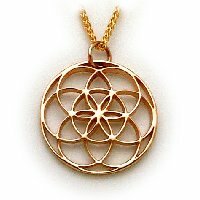 The figure on the front of the Guide pendant represents the force of benevolent spirits interacting in our human realm. Visualized as a priest or monk in the halls of a cathedral nave, or as an angel with wings, hands clasped in honor of the Divine source, this figure gives form to a facelesss fleeting presence. This piece is a tribute to the receptive guiding nature of our subconscious and the energy that flows through us from the beyond. 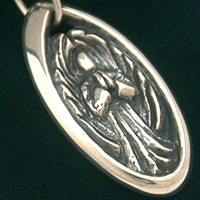 Comforting to hold, and heavier than our other pendants, at about half an ounce, or 14 grams. 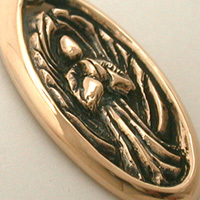 It is 1/8" thick and 1 3/4" long, and has a large oval shaped matching jump ring. The Guide is also accompanied by 20" diamond cut chain, an informative presentation pamphlet, and a genuine velvet gift box.